A New Online Youth Protection Training has been launched. This new version of YPT is for all adult leaders in all programs in BSA. The State of Texas has approved the new Youth Protection Training to be delivered both ONLINE or In Person. Either delivery method of the new course can be used to register, recharter, or attend long term camps. The new State of Texas approved Online and In Person version was released on March 13th. If you took the new online version prior to March 13th it does not meet the Texas Licensed Camp requirement. All adult leaders must take the new version of YPT, either online or In Person by October 1st. The BSA has continuously enhanced our policies and procedures to ensure we are in line with and, where possible, ahead of society’s knowledge of abuse and best practices for prevention. REVIEW AND CHALLENGE ANY ADVERSE INFORMATION DISCLOSED BY THE CHECK. IF YOU WOULD LIKE A COPY OF YOUR CRIMINAL BACKGROUND REPORT, PLEASE CONTACT YOUR LOCAL COUNCIL OFFICE. Under today’s policies, any good-faith suspicion of abuse must be immediately reported to law enforcement by members and volunteers, and an individual is removed from Scouting as soon as a report is received. Scouting’s two-deep leadership policy requires at least two adults to be present for all Scouting activities. No youth should ever be alone with a Scout leader for any reason. In fact, all Scouting activities are open to parents, and we encourage families to enjoy Scouting together. 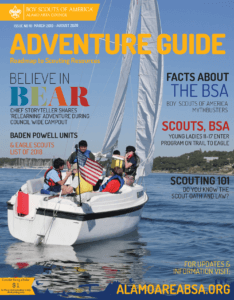 Every Scout BSA, Cub Scout, and Venturing handbook includes a pamphlet to help parents teach their children how to recognize, resist, and report abuse. The BSA has a Youth Protection director dedicated to the continued enhancement of Scouting’s training programs and policies. OR, Review the complete Boy Scouts of America Youth Protection Policy at www.Scouting.org/BSAYouthProtection.